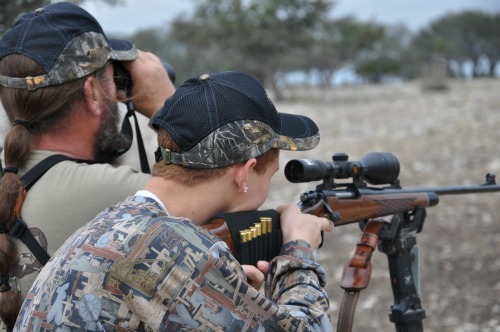 To honor their service and sacrifice Freedom Alliance, Einar Johnson and Jim Combs of the Scorpion Ranch in Harper, Texas, recently invited service members to a full day (10:30am to 10:30pm) of hunting exotic animals on their private ranch. Nine active duty and retired combat veterans who were recuperating or had received treatment at Brooke Army Medical Center in San Antonio Texas, and a few family members, came out for the event. The combat veterans bagged a total of 12 animals that day including Axis deer, Japanese Sika deer, and a Fallow deer. The Ranch owners had the animals processed, free of charge, and arranged for the meat to be delivered to them. They also provided a catered lunch and dinner. “From the very first conference call to arrange this event, Einar Johnson of Scorpion Ranch made it clear that this day was not about the Ranch, Keith Warren, or Freedom Alliance, it was about honoring these men who’ve contributed so much for our country’s safety and security,” said Freedom Alliance programs director Pepper Ailor.